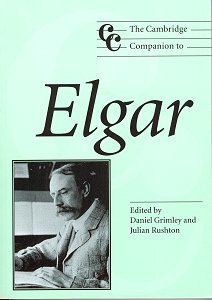 The Cambridge Companion to Elgar is one of a number of books in the Companion to Music series from Cambridge University Press. As well as composers, the series includes books on topics such as conducting and musical instruments. In the composer series, a wide variety have already been covered from the Baroque period (Bach) to the present day (John Cage) with Verdi, Stravinsky and Britten for good measure in between. The first thing to say is that there are already plenty of books available about Elgar. He has been lucky in accumulating a large number of expert biographers ranging from the present day (Michael Kennedy, Simon Mundy, Diana McVeagh, Jerrold Northrop Moore and Robert Anderson for example) to musicians who were in close contact with him during his life, such as W.H. Reed. However, as the editors Daniel Grimley and Julian Rushton explain in their introduction, this book is not a biography but a "companion". Its role is not to reiterate facts and views about Elgar. Rather, it presents a series of scholarly essays on certain aspects of Elgar's music including his compositional methods, his relationship with the Gramophone Company and the process of recording most of his own orchestral works, and the BBC. Thus it differs from the biographies in that it contains range of views on, and insights into, his music from different sources rather than offering one consistent standpoint. Furthermore, the emphasis which the authors place on the works they cover differs markedly. Byron Adams, for example, who deals with Elgar's later oratorios, goes to great lengths to consider the relationship of Elgar with, and the influence on his music of, writers such as Oscar Wilde, Newman and Catholicism and the decadence of the late 19th century literature and society. Robin Holloway, on the other hand, who examines Elgar�s early choral works, gives a more accessible overview of the works, including story-lines and musical descriptions of the pieces. I was a little disappointed by the limited amount of space allocated to the two symphonies and Falstaff. These are considered in two separate chapters, one entitled �In search of the symphony: orchestral music to 1908� by Julian Rushton and the other �The later orchestral music 1910-1934� by Christopher Mark. In both these chapters I feel that the musical analysis is somewhat brief and patchy, especially considering the importance of these works. Later in the book there are references to differences of opinion among critics as to whether or not Elgar can be called a progressive composer. It is curious then that the third movement of the Second symphony receives virtually no analysis at all. It is arguably one of the most avant-garde movements in symphonic music up until 1911 (and for many years thereafter), so it is strange that it is not given the prominence it deserves. One chapter I thoroughly enjoyed was Timothy Day�s about Elgar and recording. He notes how, throughout his life, Elgar was tremendously supportive of the new medium of the gramophone record and did much to promote its popularity. This was despite the fact that many of the early recordings had to be made with the acoustic microphone in what can only be described as extremely cramped circumstances ... some of which Day rather amusingly describes. It is fortunate that Elgar formed a good relationship with Fred Gaisberg of EMI, an American who facilitated all the later electrical recordings that we now possess, resulting in the greatest recorded legacy of a composer of Elgar�s stature�s own music. In later years, of course, composer-conductors such as Britten have extended this role to even include videos of their rehearsals and performances, but in this, Elgar was a pioneering spirit. Just as Elgar was keen on the gramophone before many of his contemporaries were, he also recognised the enormous possibilities that the BBC would eventually have in bringing music to the masses. Interestingly, in the early days of the BBC, there was a determination to make British music more widely available to a home audience, and one can see a degree of propaganda and patriotism at work. Unfortunately, this policy was sharply reversed in the Fifties and the BBC became a much more politically correct organisation, with British composers being consigned metaphorically to the scrap heap, sacrificed on the altar of the 2nd Viennese School and atonality. Perhaps one of the most interesting chapters in the book and a topic that I have not come across in such detail elsewhere is �Elgar in German criticism� by Aidan Thomson. Thomson has put together from a variety of sources a snapshot of German musical opinion of Elgar focusing in particular from the time of the Enigma Variations up until the First World War. It is quite clear that he was seen as an extremely important composer at this time in Germany and a true progressive of international stature. Over the years, especially when Elgar's star was waning, some critics have been only too keen to believe that Elgar never had any sort of international reputation and could only be considered a minor composer in the international context � a belief that this, albeit brief, chapter certainly knocks on its head. Despite having undergone a spell of unpopularity, Elgar is now a major figure in the international musical scene. It is heart-warming to see the number of performances of his music on the Continent (a couple of years ago I attended his First symphony in Vienna and the Dream of Gerontius in Munich on successive nights ... although I didn�t then make the Second Symphony in Switzerland the following evening!). So, it is fitting that a large number of books by a variety of authors are now available for those who have been attracted to his music and wish to know more about the man behind it. These biographies have now totally dispelled the popular image of Elgar as an Edwardian country gentleman and patriot, a sort of Colonel Blimp character. What comes across now is a composer who was introspective, rather depressive, melancholic, greatly influenced by nature and of an intensely nervous disposition. Where does this book fit in? Personally, I would recommend the biographies by Kennedy and Mundy to begin with. I would then proceed, if I wished to explore the composer further, to the larger books by Jerrold Northrop Moore and Robert Anderson. In a way, the Cambridge Companion to Elgar comes somewhere in between these two extremes and indeed is, as the title suggests, a companion source, though perhaps not so much to the music of Elgar but to the other volumes. I am concerned that, although of tremendous interest to an Elgar scholar, this book would be too erudite and sometimes uneven and patchy to be a first choice for the ordinary music lover who wants to know more about Elgar. It does, however, contain some fascinating and original material on this great composer, and I would recommend it to any true Elgar enthusiast who is already familiar with the other books on the market.